I hope these tips help you to add a great oak flavor to your Old Ale or other favorite beer style. Than you for joining me on the BeerSmith blog. If you want articles sent to your inbox weekly, join our newsletter and also check out the BeerSmith podcast available on iTunes. Good stuff! I’ve also heard that the denser options with less surface area (ie cubes) tend to impart a more subtle, complex flavor. I’ve tried both chips and cubes, and while the chips certainly worked faster, I preferred the flavor imparted by the cubes. I didn’t find either particularly cumbersome to remove, fortunately. Just a few thoughts/questions. From all that I’ve read and heard, the tea methods will add the oak tannins to the the beer as well as flavor. Much of the reading I’ve done recommends soaking the oak in the desired liquor for a few weeks, then adding the oak to the beer and discarding the liquor. The oak soaks up the liquor and adds the flavor to the beer, and the left over liquor removes the tannins in the fresh wood. I’ve also heard the boiling water method is for sanitizing and removing tannins, and the wood, not the tea, is added to the beer. I also see that you left one huge area out… sours, the perfect beer for wine barrels/wine soaked cubes. I have a few pounds of French Oak Cubes, Med toast that were used to revive an old red wine barrel by a wine maker in Lodi that work great in my lambic. Great article! I have heard of using oak chips/barrels, but never the “tea” method for infusing oak flavors before. I have sampled some tasty “bourbon barrel” stouts that make me want to try this method someday. Thanks! I have been using oak chips for years (mostly chips) and find the subtle flavor pulled out after a week or so in the secondary is amazing. Have made from 5 gallon batches to 25 gallon batches with this method and highly recommend trying it out if you like the flavor of oak aged beers (Firestone Walker Double Barrel Ale.) If you haven’t tried one then you should! I simply place in a strain bag and use my rice cooker to steam them then add to my conical after dumping the yeast. The only issue I have had is you need surface area contact and the strain bag can inhibit this but do not make the mistake of putting the chips in loose else you will discover it clogs the dump valve. Happy brewing! 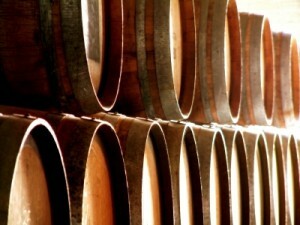 This author is spot-on, Oak Aging presents a series of challenges no matter which route you take, however the final product far outweighs any added headaches. We exclusively age in 10 and 20 liter medium-charred Oak Barrels. Smaller ones aren’t worth the hassle but they could be used in a pinch. It requires slightly more maintenance, however they are so versatile and give us the ability to layer various flavors that we could never accomplish by using chips or spirals. Check out http://www.longhornbarrels.com They have a variety of new American Oak Barrels as well as a great cleaning kit after aging any beer or wine.